With the first real snow fall of the year and Christmas right around the corner, I couldn't help but choose Andrea Bocelli's rendition of "White Christmas" or "Bianca Neve," for this week's Music Monday! This song is a classic Christmas carol, and an all-time favourite - including one of my own! Being Italian-Canadian, this version is especially heart-warming as it mixes both Italian and English. World-renowned artist, Andrea Bocelli, sings alongside Canadian musician and producer, David Foster in the video below. It was Foster who produced Bocelli's first-ever Christmas album, My Holiday, which was then turned into a PBS television special entitled, "The Andrea Bocelli and David Foster Christmas Special." 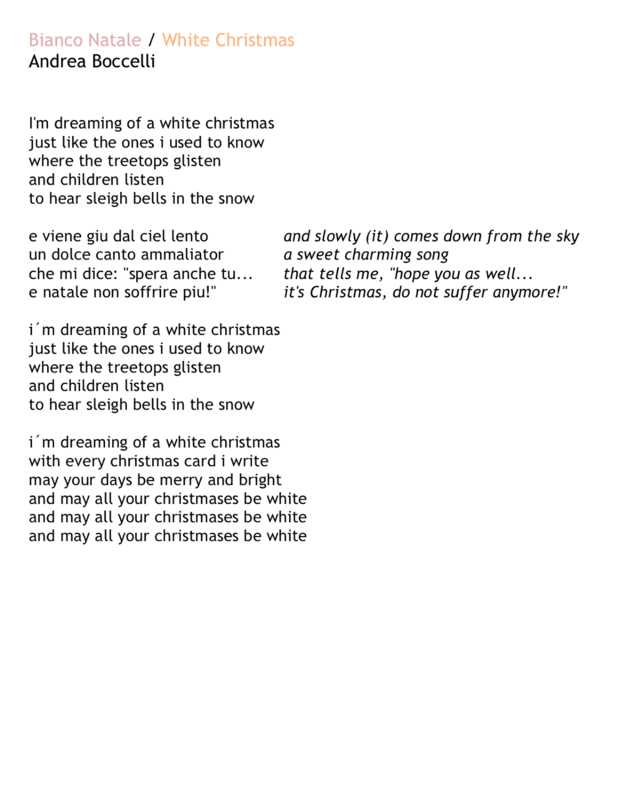 I have watched Bocelli perform this song on the special, as well as, live in concert in 2009, when he visited Toronto. Each time, Bocelli performed this song to perfection! Hope you enjoy it!